It was the Friday night before Christmas, the fire glowing in the grate, the Late Late Show on in the background. An ordinary pre-Christmas Friday night, except that for us it was not. It was to be our last night in front of the fire this Christmas, unless you count barbecues. The following day we set out for Sydney to visit our daughter Claire and her husband Mike and to meet up with our son Shane, Shan, Dermot and Shan’s MaMa who had arrived there a week ahead of us from Beijing. Instead of attending to the last of the packing, I was pulling together a folder of recipes I could cook on the barbecue or in the wok while I was in Australia. I started this blogpost that night and haven’t had a moment to finish it since. Sometimes living life to the full eats into the time for blogging. 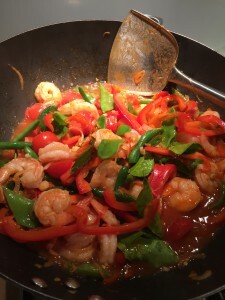 A dish that I cook often is Kaffir Lime Chilli Prawns. I got the recipe from Chi Asian Takeaway in Galway when I was researching recipes for the Taste of China section of the Dublin Chinese New Year Festival Website in 2013. It is a light, fresh-tasting, vegetable rich dish that reminds me of the kind of Asian fusion dishes I’ve sampled in Sydney so I brought the recipe with me. Fast forward a fortnight and here we are in the steamy heat of a suburban, summer Randwick evening. Christmas day is already a happy memory. We spent five days over the New Year holiday at Culburra beach in southern New South Wales. Now we are back in the Sydney suburbs and, as an antidote to the copious quantities of barbecued meat we’ve eaten in recent days, we had an Asian feast this evening of prawns, di san xiang (earth three fresh), stir-fried Chinese cabbage with chilli and ma po dou fu. Shan cooked the three Chinese dishes and you will find links to recipes for them above. I made a big platter of the prawn dish. Shan’s MaMa declared the meal hao chi – good food. I’ve many tales to tell of our adventures in the southern hemisphere and of our Australian, Chinese, Irish celebration of Christmas and the new year. Now that I am back in a wifi zone I am hoping to catch up with a few blog posts in coming days. Meanwhile I hope you enjoy the recipe below as much as we did and happy new year to all my lovely readers. I hope you continue to enjoy the blog in 2015. Heat up a wok and add a few tablespoons cooking oil. Once the oil gets very hot remove it from the heat source. Add the chopped ginger, onions, chillies and lemon grass and quickly stir them in the hot oil. Return the wok to the heat and add the red pepper, mange tout, green beans, cherry tomatoes, kaffir lime leaves and prawns. Continue to toss in the wok. As the prawns begin to firm up and turn pink, give the sauce a quick stir and add it to the wok, all the time stirring and tossing. Once the sauce has thickened turn off the heat. The dish is ready once the prawns are cooked and nicely pink. The whole process usually takes less than 5 minutes. Garnish with fresh coriander and roasted cashews and serve immediately with steamed rice. looking forward to trying this recepie,sounds yum.will let you know when I cook it.